This stainless steel watch is perfect for the man who spends time in both the office and the great outdoors. A solid stainless steel case, band, and safety buckle, along with gold two tone features make this both an elegant and robust men's watch. This watch features a quality Swiss movement, date indicator, sweep hand, and a unidirectional bezel. A 2 year warranty and water resistance to 100 meters provide you with peace of mind. A white dial along with simple hour markers add to the understated look. 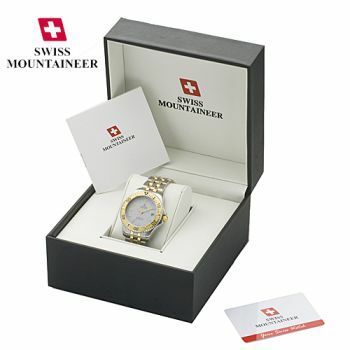 Businessman, sailor, or rugged outdoors-man, the choices are yours with this quality Swiss watch.